MolecQ Sdn Bhd formerly known as "MolecQ Sanitary Trading" established in 2007 after starting his operation 3 years back in 2004, a Malaysia based company as a principle supply of sanitary ware products for both commercial and domestic applications. Over the years, the humble company business grew, and started distributing more diversity of quality product range of decorative and commercial faucet, fittings, shower products, jacuzzi, sauna, basin, bathroom accessories and other sanitary ware products under the brand MODERN DEPOT, MODERN DEPOT SPAS and FILTON. As company expand, subsidiary company was born, Sun Global Trading was forming in 2008 to expand his business to overseas. In 2010 the company change his name to Sun Global Marketing Sdn Bhd after successfully penetrate the market in Myanmar, Cambodia and Philippines. After few years of planning, in 2015 MolecQ Maju Sdn Bhd was form to specialized in SPAS category which consist of SAUNA, HOT TUB, STEAM ROOM and SWIMMING POOL which carries the premier brand MODERN DEPOT SPAS. 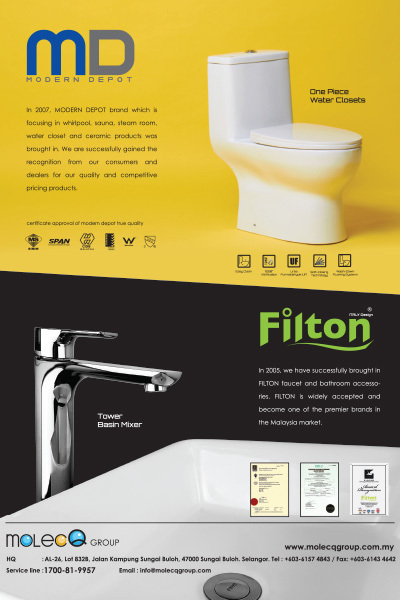 FILTON, MODERN DEPOT and MODERN DEPOT SPAS products are easily found at any of our authorized dealers and sanitary ware showroom across the nation. FILTON, MODERN DEPOT and MODERN DEPOT SPAS products are fit impeccably into modern bathroom, each product are carefully design and crafted using quality materials and advanced technologies; yet provide competitive price to ensure our products are value for money.